Jingle all the way is entered in the Color Throw Down Challenge #168 - riding hood red, daffodil delight, basic gray and very vanilla. Cute! 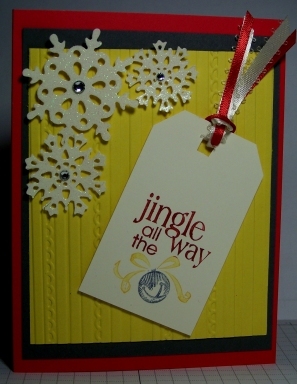 I really like the brightness of the yellow on the front of the card and the snowflakes are glittery goodness. Thanks for joining us this week at Color Throwdown!